FT-3000, made by oil soluble resin, can stand high temperature and pressure with low fluorenscence and low toxic. Therefore, it is suitable to be applied to detect wells and drill in other complicated wells. It can be directly added in various water base drilling fluids and its common dosage is 1%-3%. It can seal and prevent shales collapsing. It has a good thermal stability up to 200℃ so that it can be applied in deep or super deep wells. It can effectively reduce viscosity and filtration loss. Its low fluorescence helps it to be applied to detect wells. 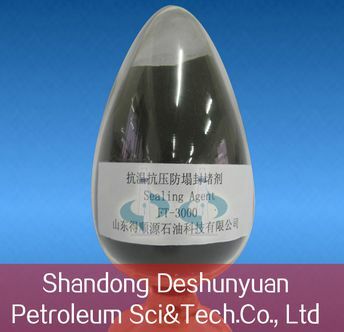 It is not toxic and helps to protect oil and gas reservior. It can match with other agents well. They are packaged in a triple sack with the lined bag. Each sack is 25kg. And they shall be stored in shady, dry and place with good ventilation. They shall be avoided to touch with eyes, skin and clothes. If touched, they shall be cleaned by a great amount of clean water.